Any industry landscape is littered with companies being bought and sold and changing their names faster than Margaret Thatcher changed his or her underwear, but just for fun, as a brief, related aside, let’s take a quick look at the ownership and name changes The Dalmore’s parent company went through in the last 22 years. In 1990, Whyte & Mackay Distillers Ltd. was purchased by American Brands, a sprawling holding company that got its start in tobacco and by this time had a range of products including cabinets, windows, locks, golf equipment, booze (Jim Beam), and perhaps most importantly, Swingline Staplers. American Brands re-branded itself Fortune Brands in 1997 and its European division seems to then have been re-named JBB (Jim Beam Brands) Greater Europe Plc. in 2001. That didn’t last long as a Scottish-led management buy-out then took control of JBB and renamed it Kyndal Spirits. Wisely, the new owners quickly decided that Kyndal sounded like some kind of futuristic reading device and what the company really needed was a good, solid, Scottish sounding name. They pondered and pondered and in 2002, renamed the company…Whyte and Mackay. Somebody somewhere has boxes full of all these obsolete business cards and stationary, I’m sure. Believe it or not, Whyte and Mackay was purchased yet again in 2007 by United Spirits. Luckily for us, throughout this silly, corporate three-ring circus, excellent whisky continued to be made. 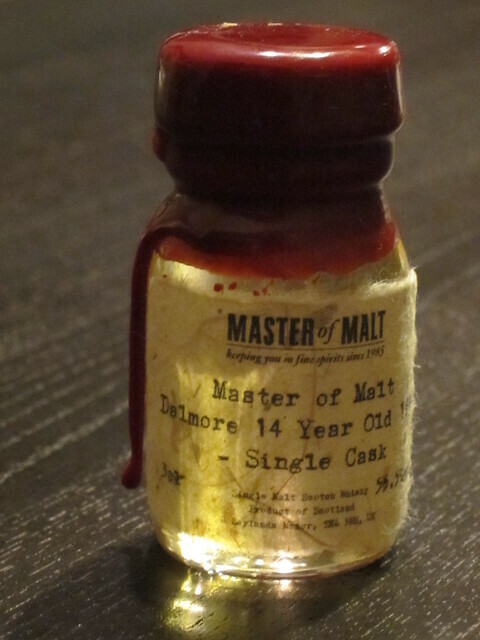 This 14 year old single cask bottling from the incomparable Master of Malt was matured in a re-fill hogshead and unlike most distillery Dalmore expressions, was bottled non chill-filtered at cask strength with no caramel color added. The Palate: The juicy youthfulness of the palate caught me off guard here with spirity white grape juice and candied orange. Joined quickly by some lightly sour malt, salted nuts, and some citrus rind, that hot high-octane tingle continues. Bright but brash, bitter spice and wood notes bring things to a close with a bit of ginger, white pepper, and salt. A little water takes the edge off a bit and quiets those upfront fruit juice notes. A bit more sherry influence comes through as well, but it still winds up being a little sour, spirity and bitter at the end. The Finish: Still young, with more ginger, bitter citrus pith and unsweetened chocolate. Thoughts: I would’ve never guessed that this spent 14 years in a sherry cask, a tight ex-bourbon barrel, finished in a Manzanilla or some white wine cask, maybe, but not solely in a sherry cask. There’s not much here that says “The Dalmore”, and while there are interesting, winey, fruity moments, ultimately it’s the surprising spirity and bitter youthfulness that keeps me from thinking more highly of it. With an ABV of 55.5% it takes a lot of skill on the part of the distillery to avoid a spirited or hot flavor profile. Some can pull it off. How? Time. Sounds like 14 yrs was not enough. I think it probably comes down to the barrel. In this case, the barrel might have been a little spent and therefore didn’t help to quiet those spirit-y notes. Ironically, I always wish The Dalmore would bottle at a higher ABV, and then when I get to try a cask strength version, it comes from flat wood. I think this sort of dram is one of my biggest disappointments, where you know exactly what you want it to be, you have an idea of where it wants to go, but it just hasn’t quite got there – i suppose there’s just a hope that there’s another cask of this somewhere waiting those few years more that it needs…. I think it was a rather lackluster cask to blame in this case. The 14 years just didn’t smooth out the spirit and add the usual complexity. Maybe another few years would’ve helped, maybe not.